Built for those with a love of speed. Be the first to capture the extraordinary, and grab the moments that other photographers miss. Whether it’s stills or movies, express your creative side like never before. Track and focus on fast-moving subjects. Shoot bursts of images at up 10 frames per second, with full autofocus and auto exposure. Responsive handling means you'll capture the split-second moment you are chasing, and a generous buffer lets you keep shooting without a drop in performance. The EOS 7D Mark II uses Dual "DIGIC 6" image processors to deliver a responsive performance. Minimal lag time when shooting means you'll capture fleeting moments with precision timing. For pin-sharp focus while you shoot EOS 7D Mark II has 65 focus points track fast moving subjects. Each focus point is a 'cross-type'* meaning it can lock on to both horizontal and vertical detail quickly and accurately. To assist shooting in extreme low light conditions 7D Mark II can focus even under moonlight conditions where light levels can be as low as -3EV. Use all 65 AF points together, or group them into moveable zones that cover off-centre subjects. Alternatively, select just a single AF point to focus precisely on a specific part of the scene. The EOS 7D Mark II's iTR AF focusing system uses colour and face information to recognise and track subjects as they move around the frame. AF responsiveness can be customised using a simple tool which adjusts the focus tracking according to the shooting environment and subject, so that other objects passing momentarily in front of the subject don’t interfere with focusing. From wildlife to motor sports to street photography, a newly designed 20.2 megapixel sensor delivers results you'd be proud to see on the wall. Even in poor lighting the EOS 7D Mark II delivers photos and movie clips that are packed with detail. For consistent, accurate exposure metering the EOS 7D Mark II uses a 150,000-pixel sensor to split up the scene into 252 areas. Each one is analysed and the correct exposure settings are either set automatically or recommended to the photographer. Infrared light is measured as well as light in the visible part of the spectrum, for greater accuracy in tricky lighting conditions. When light levels drop, keep shooting without compromising your creativity. The EOS 7D Mark II delivers superb image quality at ISO sensitivities up to ISO 16,000 (expandable to the equivalent of ISO 51,200) – perfect for discreet street photography, freezing the action in difficult conditions, and even hand-held macro photography. How will you use your EOS 7D Mark II? Set up the shooting controls, the focusing system and a host of other custom controls just the way you like it. Even the camera's 100% viewfinder can be personalised with its real-time electronic display. Many of the EOS 7D Mark II's controls are customisable allowing you to set-up the camera according to the task in hand. Save your customisation as a preset for instant recall in the future. Enjoy a natural view through the EOS 7D Mark II’s viewfinder, with approximately 100 per cent viewfinder coverage and 1.0x magnification. A transparent LCD screen overlays focus and shooting information as well as a dual-axis electronic level for straight horizons. The EOS 7D Mark II’s autofocus system can be fine-tuned according what you’re shooting and how you’re shooting it. And when you’re working quickly, just choose from one of six AF preset combinations to modify the camera’s behaviour. From the street to the studio, the EOS 7D Mark II performs in every photographic situation. Its speed and precision make it ideal for sport and action, while its low light capabilities and built-in GPS make it a great choice for the travel photographer. The only question is, how will you use yours? When conditions take a turn for the worse, carry on shooting with confidence. Weather-sealed controls protect the EOS 7D Mark II against water and dust, and magnesium alloy construction adds durability. The EOS 7D Mark II can geotag images and movie clips with your exact position wherever you are in the world. Record longitude, latitude, elevation and compass direction as well as coordinated universal time. When shooting in high-contrast conditions, HDR shooting helps preserve detail in dark shadows and bright highlights. In quick succession the EOS 7D Mark II captures three images at different exposures and blends them together for a natural-looking result straight from the camera. Create composite images in-camera by using multiple-exposure mode to layer images on top of each other. The EOS 7D Mark II has dual memory card slots, enabling automatic back up of files as you shoot, and extended storage capacity. A built-in interval timer allows images to be recorded at pre-programmed periods – a great way to record a slowly changing scene and create time-lapse movies. For extreme long-exposure photography, the EOS 7D Mark II’s shutter can be locked up in bulb mode for a specified time. Put the bundled Wi-Fi adapter W-E1 into the camera’s SD-card slot for wireless shooting and camera control, including remote live view from the screen of your smartphone, tablet or computer. Transfer image files to your smart device while on location, for easy upload to social media and file sharing services. Take your movie projects to the next level with industry-standard features. Enjoy shooting Full HD 'slow-mo' sequences at 60fps, and take control of audio with microphone and headphone sockets. Advanced video functions include Full HD (1080p) capture at variable frame rates up to 50 or 60fps - ideal for fast moving action or slow-motion footage that looks silky smooth, revealing the subtleties of motion on camera. A pure HDMI connection can be used to output Full-HD footage to external recorders, allowing the EOS 7D Mark II to fit seamlessly into professional video-editing workflows. Headphone and microphone sockets let you record a high-quality digital soundtrack, and silent controls allow you change the camera’s settings without producing distracting noise. A collection of inspiring images shot on the EOS 7D Mark II. 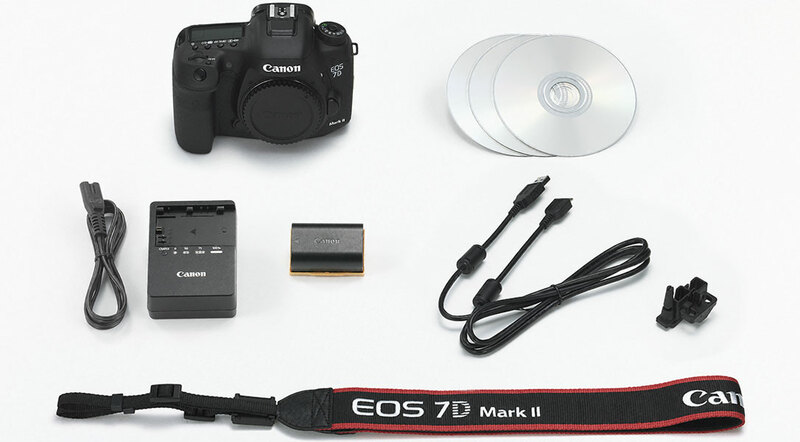 Find out more about the EOS 7D Mark II, its features and what it can do. Shoot continuous bursts of images at up to 10 frames per second. Shoot at high frame rates and enjoy superb colour reproduction. Each scene is dissected and analysed for consistent accurate exposure metering. Focus on subjects wherever they are, with 65 cross-type AF points spread across the frame. Capture movies at up to 1080p resolution and 60fps frame rate. Mic and headphone sockets for full audio control. Dual memory cards slots enable automatic back up as you shoot, or extended storage capacity. Geotag each photo and movie you shoot with your current location – great for travel photographers. An ultra wide-angle zoom lens with dynamic expressive capability for all EF-S mount EOS cameras; exceptionally small and lightweight for maximum mobility. With a compact, lightweight design that's ideal for travel, this ultra wide-angle EF-S zoom lens lets you fit more in every shot for dramatic landscapes and expressive architectural images. A highly portable pancake lens that's ideal for travel and street photography. Its advanced optical design ensures great image quality, while a large f/2.8 maximum aperture allows hand-held low-light shooting. STM focusing delivers smooth, near-silent AF when capturing movies. Store your photos safely on-line, and share them with friends via social networking platforms.